Attending a wedding can be an expensive endeavor. Depending on how far it is, you may have to spring for transportation and lodging costs, and you might need to buy a new formal suit or dress. Then there’s also the wedding gift. Just how much should you spend on this? What you spend on a wedding gift can be a very individual decision. A lot depends on how well you know the bride and groom, how formal their wedding is and what type of budget you’re working with. It’s also worth noting that contrary to what you would believe, giving a wedding gift isn’t mandatory. You could actually go empty-handed and not be breeching any etiquette. Yet most people would feel strange skipping this step. If you don’t know what to give as a wedding gift, a good place to start is by looking at the couple’s wedding registry for ideas. Some of the chain stores where couples typically register include Crate and Barrel, William-Sonoma, Pottery Barn, Target, Sears, Macys, and Tiffanys. You can access a couple’s registry online or in the store by either partner’s last name, or by the wedding date. If you decide to shop from the registry and want to buy something substantial, it’s a good idea to purchase it well in advance since the pricier items on most registries can go quickly. If you wait too long and there’s no gift left that you feel comfortable giving, the experts suggest sending a gift card to the store and letting the couple select for themselves. If you prefer to give the couple money, either in the form of cash or a check, this is always a very welcome choice. Weddings can be very expensive, and the honeymoon can be costly, too. Therefore most newlyweds will greatly appreciate receiving a monetary gift that they can use for whatever they need or save for the future. A handmade gift can also be very well received, particularly if it’s something specially made for the couple’s taste and interests. In fact, some of the more personal gifts are the ones that the bride and groom will most cherish throughout their marriage. For instance, you might decide to make a special scrapbook of the wedding day and of the events leading up to it. This can be a very welcome and very special gift, regardless of how much money you invest in the materials. If you have any special talents, you can also put these to work for your gift. If you’re a professional singer, you could offer to perform during the ceremony and save the couple from having to spend the money hiring someone. Or maybe you’re a professional artist. In that case, you might paint a portrait of the bride in her wedding dress and have it framed as a wedding gift. You may wonder when to deliver your gift. Should you bring it to the wedding or send it on ahead? 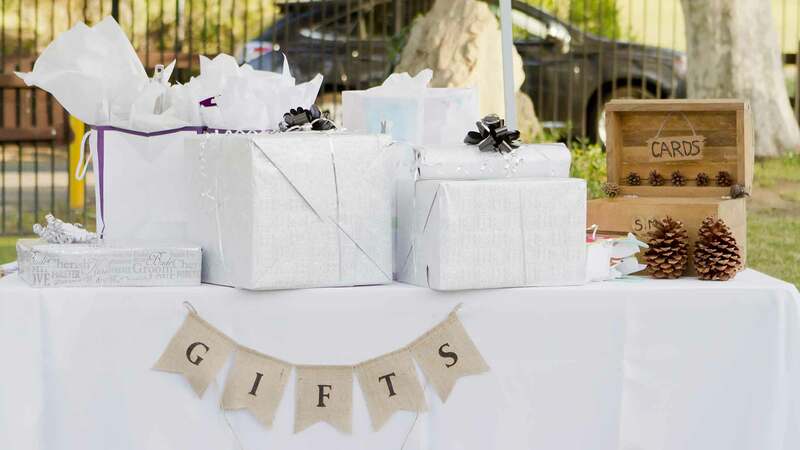 The traditions vary in different parts of the country, but most often, you should send ahead any bigger or bulky gifts so the couple doesn’t have to worry about getting it home after the reception is over. But if you’re giving money or a gift card to the couple, then by all means, bring it to the wedding itself. When you’re determining how much to spend on a wedding gift, there are several accepted methods you can use to determine a price range. You could make a list of all of the wedding-related activities, such as the engagement party, bridal shows and the wedding itself, and determine the total amount you want to spend. Then you can divide the total up among these three events. Usually about 60 percent should go the wedding, while 20 percent can go to each of the other activities. This means that if you have $300 you want to spend, you can give $60 for the engagement party and $60 for the shower gift. This leaves you $180 for the wedding gift. If you aren’t invited to the party and shower, though, you can put the extra money into your wedding gift or lower you budget instead. You can also take into account all of the wedding-related expenses you’ll be incurring. For instance, if you’ll need to spend money on an airline ticket and hotel, you’ll probably want to spend a little less on the gift. If you live locally, though, you may be able to be a little more generous. Another way to gauge a gift amount is to base it on the price of the wedding meal. If you are attending a formal Saturday night wedding at a 5 star hotel, let’s say that the wedding couple is spending $175 per person on the food. This means that that you may want to spend about the same amount back on the gift. However, many etiquette specialists say that this rule is now outdated, since you shouldn’t be expected to think about your gift as “payment” for being invited to the wedding meal. If one of the newlyweds is a close friend or family member, you’ll want to spend more on a gift than you would for a co-worker or casual friend. You should also put more time and thought into a gift for a close friend. Here’s how the experts suggest these results can translate into your next wedding gift. For a colleague or business associate, you might spend between $50 and $75 while for a friend or relative $75 to $100 is the norm. But for a close friend or more immediate relative, spending between $100 and $150 is a reasonable amount. Where you live can also make a difference in what you spend. For instance, in more rural parts of the country, spending $50 on a wedding gift, regardless of relationship, is pretty typical, while in cities such as New York, Boston and Chicago, a minimum of $100 is the rule of the thumb. Note that if you are going as a couple to the wedding, you should plan on doubling these amounts. So you should spend anywhere from $50 to $150 for a wedding gift if you are attending the event alone, or from $100 to $300 if you are going with a date or spouse. Further, even if you can’t attend the wedding, it’s still appropriate to send the couple a congratulatory gift. If you want to give a big gift to the newlyweds but can’t swing it on your own, you might consider getting together with several other guests and chipping in to buy the big-ticket item, such as a television or weekend away. This can be a wonderful way to stick to your budget and still give the wedding couple something they will love.